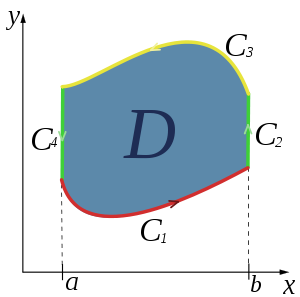 In mathematics, Green's theorem gives the relationship between a line integral around a simple closed curve C and a double integral over the plane region D bounded by C. It is the two-dimensional special case of the more general Stokes' theorem, and is named after British mathematician George Green. For positive orientation, an arrow pointing in the counterclockwise direction may be drawn in the small circle in the integral symbol. In physics, Green's theorem is mostly used to solve two-dimensional flow integrals, stating that the sum of fluid outflows at any point inside a volume is equal to the total outflow summed about an enclosing area. In plane geometry, and in particular, area surveying, Green's theorem can be used to determine the area and centroid of plane figures solely by integrating over the perimeter. The following is a proof of the theorem for the simplified area D, a type I region where C2 and C4 are vertical lines. A similar proof exists for when D is a type II region where C1 and C3 are straight lines. The general case can be deduced from this special case by approximating the domain D by a union of simple domains. are true, then Green's theorem is proven in the first case. Now compute the line integral in (1). C can be rewritten as the union of four curves: C1, C2, C3, C4. Combining (3) with (4), we get (1). Similar computations give (2).